Citizens seeking active roles in their communities face a fundamental challenge. Community-based organizations, which were once the vehicles for bringing citizens together into public work, have changed in essential ways. Civil society is now the realm of professionally managed organizations that are defined by particular problems or needs. Professional managers are trained to see citizens and their informal associational interactions only in the context of the problems that the organization itself is charged to solve through its programs. Citizens are no longer seen as necessary assets in public work. Rather than active decision-making actors, they are clients or customers to be served, victims to be aided, or donors to support work designed and governed by the professionals. With the growth of professionally managed nongovernmental organizations, the active involvement of nonprofessionals in the governance of their own communities has been stifled. Many studies suggest that the Tocquevillian notion of civic work—done by ever-shifting interactions among loose associations initiated and driven by coalitions of citizens—is disappearing from the minds of citizens and professionals alike. Those citizens who do try to take responsibility are faced with the administrative routines of community-based organizations that are focused on the never-ending search for operating revenue and organizational sustainability. Meanwhile, however, a countertrend appears to be occurring. In Doing Democracy, Scott London reports on the emergence of a growing network of organizations that are exploring ways to act as “centers for public life.” What distinguishes these centers is that their work is not focused on any particular problem or on advocacy for particular groups. Instead, the centers act as community and regional hubs for experiential learning about the practices that shape the capacity of people with different convictions, interests, and abilities to work in complementary ways in combating common problems as they emerge. While they take a variety of forms, the centers are all exploring practical ways to strengthen the ability of people to shape the futures of the places where they live, and by extension, of the country. The core idea is that democratic public life depends on citizens as fundamental decision-making actors. The centers help design and support interactions among citizens that can facilitate the recognition of common purposes and ways to constructively work through the inevitable tensions that emerge as people attempt to act in concert toward shared goals. That is to say that they are working to encourage a more democratic and deliberative public life, surely a mission of great importance at a time when incivility, hyperpolarization, and citizen disengagement undermine our democracy. The centers for public life have been an invaluable resource for Kettering Foundation research. For more than three decades, the centers have engaged in learning exchanges with Kettering. Some of the centers focus on the challenge of developing and recognizing a “public voice” on federal policy issues. Other centers work with people attempting to develop the ability of their communities to address the local concerns of citizens. Such centers have much to share about the ways that the quality of public decision making affect citizen-based public acting; the ways that deliberative practices can make the interactions in a place more complementary and reinforcing; and the ways that people can more effectively learn together about the practices that determine the strength of public life in their communities and sustain their efforts. 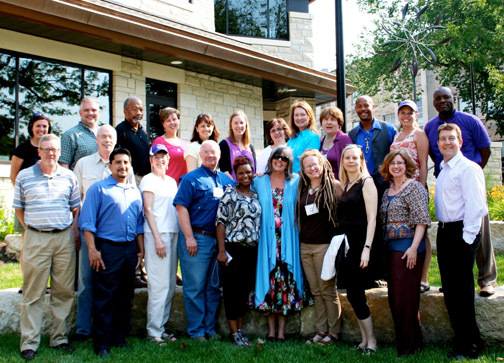 In 2011, Kettering began a learning exchange with prospective new centers. We want the new centers to begin with recognition of the insights derived from the years of experiments by the network of organizations attempting to encourage democratic public life. We wanted to emphasize the challenges of entering public life in a constructive way, of which deliberative forums was only one part. This history provides new centers with a sense of practical possibilities, clearly aligned with a theory of democratic public life. Another goal is to introduce new centers to the existing network of centers and so encourage the ongoing development of learning exchanges among them. Centers that participate in these exchanges learn from each other’s experiments, and the Kettering Foundation also gains from the exchange by learning from the centers’ experiments and insights. They recognize opportunities in bringing citizens into deliberation on public issues. Some are concerned that democratic participation of citizens is low and that they can’t get things done in their communities and others that political rancor alienates citizens and alienates the young people that we will depend on in the future. They are willing and eager to experiment with something new. They are not particularly interested in a single issue. They are interested in using National Issues Forums as one vehicle to address problems. They have an interest in conducting workshops for other organizations in their communities to encourage convening and deliberating about public issues. They have an association with an organizational entity and a potential network of partners in the work. They are interested in, and have the capacity for, learning from and with other centers. They see themselves as part of a larger effort to invigorate democratic public life in communities and the nation. The 18-month exchange with a cohort of new centers has several components intended to foster learning. First, at least two people from each organization participate in the work. The need to find a partner early in the exchange encourages independent-minded academics and practitioners to begin thinking about networks and partnerships early in the work. It also creates a greater opportunity for sustainability should one partner move on. Second, each cohort consists of 9 or 10 new centers that agree to attend a series of workshops at the foundation to share the challenges this work can bring, as well as create new ideas and opportunities for practice. In these workshops, they talk about what they are doing and what they are learning. This reflective practice helps develop the habit of intentionally engaging lessons from community work that often goes unexamined in people’s busy lives, a practice we hope they will use within their own networks. The cohort also includes four or five people from longer-standing centers. These veterans’ experiences help new centers realize the potential for their own centers and various ways the efforts can be organized. The resulting exchange is also an opportunity for the veterans to become more self-conscious of their practices as the new centers critically interrogate the politics embedded in the work. Working together in this way helps create a community of practice that can serve as a network for ongoing learning long after the 18-month exchange has ended. Another important part of the exchange is working through a “curriculum” that exposes the new centers to democratic practices in theory and in practice. Centers are asked to experiment in their own communities with ideas and then report on what they learn. The kinds of experiences they attempt include finding ways to hold meaningful National Issues Forums, thinking through the best design for the problem they face and the community they engage. They also prepare forum moderators through their networks to expose these networks to deliberative discourse and help spread the work and ideas. In addition, they examine their networks of interaction and identify how they might bring diverse voices into exchange on difficult issues. Part of that network building occurs through actually framing issues with public actors. Finally, at the end of the 18 months, we invite the new centers to consider exploring one of Kettering’s research questions in their community. In this way, centers strengthen their roles as scholar-practitioners. By thinking about the practice changes they are making through a democratic lens, they can better understand what they might want to advance, eliminate, or revise in their approach. As part of their research, they also write what they are learning so we may share it with other new centers. Two new centers involved in the exchange that began in 2011 help reveal approaches to change in public life these centers are initiating. First, the university administration was not open to creating a new center. We are part of a university system of 35 colleges and universities with specific definitions for institutes and centers. The way we got around this was to take an established university entity, in our case the American Democracy Project, and create a democracy project within the ADP. We call our “center” the Public Voice Partnership. Second, we began to establish community partnerships and provide facilitation for community issues. We teach public deliberation courses, and our students become the facilitation team members to support our deliberative work in the community and region. My colleague teaches rhetoric courses, and I teach several sections of a course in “Critical Thinking: Public Deliberation.” We also train campus and community members to become facilitators. Consequently, by embedding deliberative work in the curriculum, we have credibility and student participants at all times. Third, . . . we are involved in a two-year research project . . . Cultivating Deliberative Democracy in Milledgeville . . . using the Shaping Our Future national conversation as our first issue. We kicked off a series of public forums last week, which will continue throughout the academic year. Several students . . . have become “research associates” with the Public Voice Partnership. . . . My students and I will hopefully present our Shaping Our Future year’s effort at the American Democracy Project meeting in Denver next June. The efforts at Georgia College reveal how two faculty members have identified a need for a change in public politics in Milledgeville. They are doing this work in conjunction with students, recognizing that they can become future community-based change agents if they are involved in community work as part of the curriculum. They are creating a change in pedagogy and working to strengthen the capacity of students. Furthermore, they are engaging a variety of new networks typically not involved in deliberation about education, including African Americans and lower-income residents. Kaufman reports that the people typically attending public events “are disproportionately white and economically secure relative to the total population. Consequently, there is a gap in the ‘public square’ that could be filled by a more inclusive approach to seeking the public’s voice on a variety of important community issues.” This center has changed the conversation. Augsburg College in Minneapolis, Minnesota, is developing a center for public life to create change in the community’s political discourse and capacity for democratic practice. They recognized a challenging problem in the local immigrant neighborhood, which includes North Africans, Somali Muslims, Ethiopians, and Eritrean Christians. They saw that issues are raised in unhealthy ways, through violence and religious and ethnic division. These groups did not recognize nor exercise their capacity for shared discourse. This center wanted to begin cross-cultural work that would lead to stronger democratic practice. They started The Common Table, a space to gather for meaningful conversations, respectful exchanges, and better framing of issues. They see The Common Table as more than just a space to build relationships; it is also a place to tackle difficult topics and community stressors. By encouraging deliberative forums and other means of discourse, the self-interests of the groups can become a collective interest. The university and the students are all part of the community and, by providing neutral space, they are opening the community to change. The community recognizes its role in the exchange with Augsburg by encouraging Augsburg not to study them, but to study with them. This sort of exchange is consistent with Kettering’s idea of change in political practice through learning exchange. It is also consistent with the democratic practice of naming and framing issues and deliberating about them to recognize what is held valuable. We have much to learn from such efforts and on the actions that will follow. We need more opportunities to learn about the challenges civic innovators face in creating and sustaining entities for learning-based change. The connective practices they work through are the key to understanding how communities can continue to develop as places where people can prosper together. If you are interested in creating a center for public life, we want to hear from you. Alice Diebel is a program officer at the Kettering Foundation. She can be reached at diebel@kettering.org. Randall Nielsen is a program officer at the Kettering Foundation. He can be reached at nielsen@kettering.org.